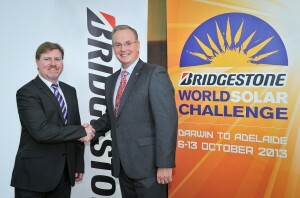 Bridgestone has announced it will be the title sponsor of the World Solar Challenge 2013 to beheld from Darwin to Adelaide from October 6-13.The Bridgestone World Solar Challenge 2013 will see a record 45 teams from 26 countries participate in a 3000 kilometre contest which crosses the continent using only solar energy to power the vehicles. The 2013 competition will be the 12th running of the event since 1987.“Bridgestone has a global commitment to continually working toward a sustainable society and the Bridgestone World Solar Car Challenge 2013 is a natural extension of this as it encourages and promotes investment and innovation in solar technology,” said Andrew Moffatt, Bridgestone Australia and New Zealand Managing Director.“It’s also a good fit because of the tremendous interest Australian motorists are now taking in technology that can lower the impact of their vehicle on the environment.“This is reflected in the success of our Ecopia low-rolling resistance range of tires which are continuing to grow in popularity with Australian drivers because of their fuel saving and environmental benefits,” Mr Moffatt said. Chief Executive of the South Australian Motor Sports Board Mark Warren said the Bridgestone partnership continued the high standing of the World Solar Challenge on the global stage.“It is fitting that the naming rights for 2013 go to such a progressive company that cites within one of its corporate philosophies ‘Shinshu-Dokuso’ which I’m told means creative pioneering,”Mr Warren said.“In our 26 year history we too have aspired to be creative pioneers in our quest to realize the dream of the world’s first truly efficient solar electric vehicle. With the support of Bridgestone this quest is one step closer to reality.”The Bridgestone World Solar Challenge 2013 will feature three separate classes; the ‘Adventure Class’ for pre-2013 event cars, the ‘Cruiser Class’ for vehicles designed for practicality and the elite ‘Challenger Class’, which compete for line honors with the fastest overall time. This entry was posted on Wednesday, August 21st, 2013 at 5:18 AM	and is filed under Events. You can follow any responses to this entry through the RSS 2.0 feed. You can leave a response, or trackback from your own site.